Comet Ridge’s ATP 1191 (formally ATP 337) Mahalo asset is located in the Denison Trough area of Queensland’s Bowen Basin near Rolleston, and covers an area of 911 km2. Comet Ridge has a 40% interest in ATP 1191 Mahalo JV Project Area with a clear focus on maximising 2P Reserves in the block. ATP 337 was awarded on 1 October 1983 for a period of 4 years to CSR Ltd (60%) and OCA (40%), and included 181 blocks. ATP 337 was converted from a 1923 Petroleum Act permit to a Petroleum and Gas (Production and Safety) Act 2004 permit. This process included a change in permit number from ATP 337 to ATP 1191 and the permit remains an Authority to Prospect. ATP 1191 has been granted for 4 years from 25 September 2015 until 24 September 2019. The Mahalo JV Project Area is a subset area of ATP 1191, and covers approx. 11.6 graticular blocks. Comet Ridge farmed-in to the Mahalo JV Project Area acquiring a 40% interest in the JV Project Area in 2004, with Santos and APLNG retaining a 30% interest each. Santos and APLNG each hold a 50% interest in the remainder of ATP 1191. Comet Ridge reduced its interest in the Mahalo JV Project Area to 35% in late 2011 through the divestment of a 5% interest to Stanwell Corporation. In late 2014, Comet Ridge announced the buy back of a 5% interest previously sold to Stanwell, returning Comet Ridge’s interest in the Mahalo JV Project Area to 40%. 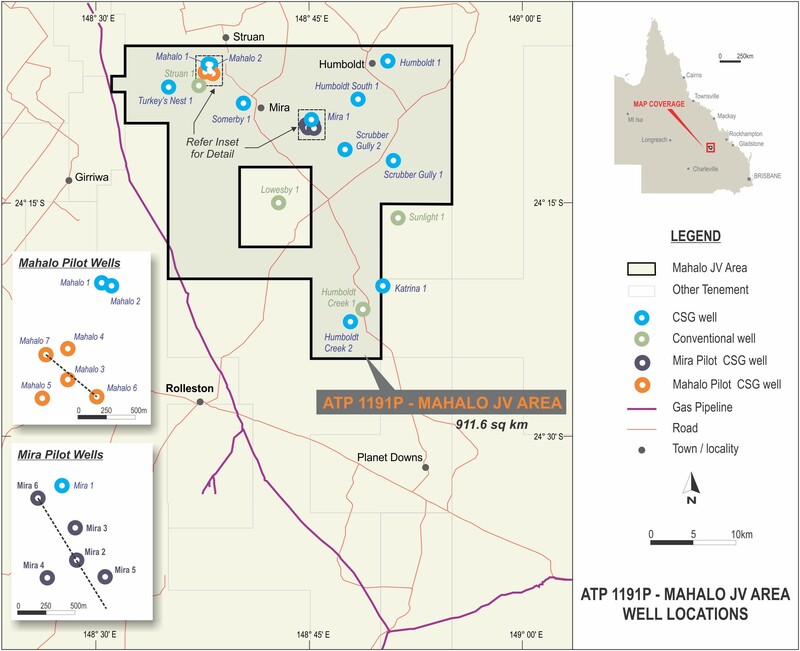 Twenty-four wells have been drilled in the Mahalo JV Project Area in total, with twenty of these drilled since Comet Ridge acquired its interest in 2004. ATP 1191 is located in the Denison Trough in the Bowen Basin in central Queensland. Early petroleum exploration in the region had focussed on conventional resources in Permian sandstone reservoirs, resulting in the discovery of several gas fields. Arcturus and Yandina conventional gas fields are located just to the west of the permit area. These gas fields are serviced by processing and separation facilities located in the northern Denison Trough and gas is distributed via the state natural gas pipeline network. Prior to commencement of CSG exploration in the permit area, very few petroleum wells had been drilled within the Mahalo JV Project Area since Sunlight 1, a conventional well in 1966 and Humboldt Creek 1, in 1970. Lowesby 1 was drilled in 1991 in the area excised from the centre of the ATP 1191 Mahalo area. Gas indications were noted over coal seams confirming the presence of gas associated with the coal seams. The Mahalo JV Project Area is prospective for both coal seam gas and coal extraction in the Permian Bandanna Coal Measures that are draped over a structural high known as the Comet Ridge nose anticline. Over 50 shallow coal exploration holes had previously been drilled within the northern part of the project area where coals are at shallow depths. These shallow wells provided confidence that net coal thickness was extensive across the Mahalo JV Project Area. 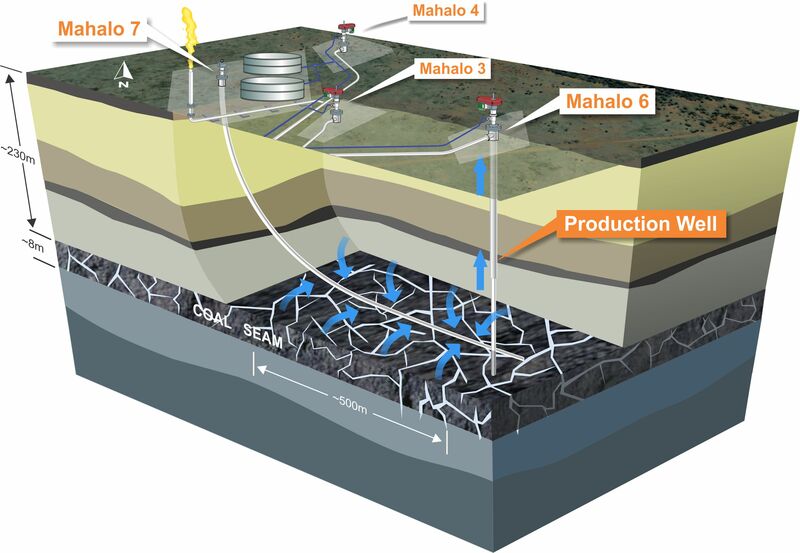 Coal seam gas exploration commenced in the Mahalo JV Project Area in 2004. Fully cored coal seam gas exploration wells, Mahalo 1 and Somerby 1 were drilled as part of the Comet Ridge farm-in to evaluate extent, permeability and gas content of the coal seams in the Bandanna Coal Measures in north-western part of the tenure area. 6-7m of net coal was intersected with gas contents over 5m3/t. This initial exploration phase was followed in 2006 by Mahalo 2 (100m from Mahalo 1) and Mira 1 and Humboldt 1 in the eastern part of the permit area to verify extent, permeability and gas content of the coal seams in the Bandanna Coal Measures. Permeability ranged between 6 and 56 millidarcies, average gas content ranged between ~5 and 7.6m3/t and up to 8.1m of net coal was intersected. Average gas content and permeability figures were encouraging and similar to other commercial coal seam gas development projects in Queensland. On completion of these wells, Comet Ridge had earned 40% interest in the project. Scrubber Gully 1 core hole was drilled in July 2009, successfully demonstrating coal continuity from adjacent permits into the central-eastern portion of the joint venture area. Concurrently, coal seam gas exploration activities increased in the surrounding northern Denison area first with the drilling of Katrina 1 in 2007, Luka 1 in 2009 and Bungawarra 1 and 2 in mid-2010. These wells were drilled outside the Mahalo JV Project Area, but both Katrina 1 and Luka 1 were drilled near the boundary of the Mahalo JV Project Area by Comet Ridge’s ATP 1191 Mahalo Joint Venture Partners. In July 2012, the Joint Venture commenced work on the first four-well pilot scheme with the drilling of the Mahalo 3, 4, 5 and 6 wells, north of Rolleston. Drilling was completed at the end of July. Each of the wells intersected approximately 7 metres of net coal in the main Castor-Pollux seam as anticipated. This area of the block has shown good continuity and thickness of coal with very good to excellent permeability across the main reservoir section observed just after drilling. Following on from drilling of the four Mahalo field pilot wells in mid-2012, the Joint Venture commenced drilling of the second pilot at Mira in December 2012. Each of the wells intersected approximately eight and a half to nine metres of net coal. Like the Mahalo field pilot scheme, 13 km to the northwest, Mira continued to demonstrate excellent coal productivity. Completion operations were then undertaken, with both the Mahalo and Mira pilot wells set up for production with tubing and pumps installed. Drilling operations then stepped-out from the pilot area in early 2013 and coreholes were drilled southeast, south and southwest of the Mahalo and Mira pilot areas at Scrubber Gully 2, Turkey’s Nest 1 and Humboldt Creek 2. Scrubber Gully 2 was a 5.2 km step-out from Mira and intersected 7.2 metres of net coal whilst Turkey’s Nest 1 was drilled 5 km southwest of the Mahalo pilot intersecting 9.6 metres of net coal. Humboldt Creek 2 was drilled in the southern part of the block, intersecting 9.4 metres of net coal. The Mahalo and Mira pilots were commissioned in the final quarter of FY2013. 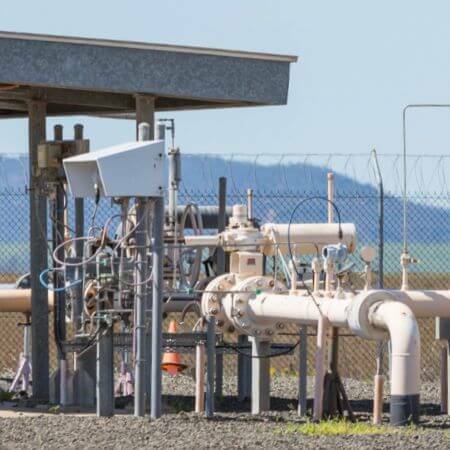 Following the commissioning of both the Mahalo Field and Mira Field pilot schemes, the Joint Venture focus was on dewatering the coals to enable gas to flow. It was established that the Mahalo Pilot required some remedial work to improve well productivity and this was carried out in early 2014 with Mahalo 3 and Mahalo 5 both stimulated via under-reaming and jet washing. In line with current practice in other parts of Queensland, the wells were brought on at a low pump rate with the plan to steadily increase pumping speeds over time which is designed to protect the reservoir from shock or damage. Gas production has been rising in the Mahalo Pilot since early March 2014 when the wells were brought back online following the stimulation. As part of the plan to build reserves and deliverability, Comet Ridge and its joint venture partners approved the drilling of the first horizontal well (Mahalo 7) at the Mahalo Field Pilot. The Mahalo 7 horizontal well was completed in December 2014. This involved removing the existing pump from Mahalo 6 and running in homing equipment in the well to allow for the Mahalo 7 intercept. The Mahalo 7 horizontal well was drilled horizontally through a significant section of the coal reservoir, intercepting the Mahalo 6 well on the first attempt. A new pump was then run into the Mahalo 6 vertical well to lift the water produced from the Mahalo 7 horizontal well section. This work was undertaken in mid-December 2014 and the pump was put on line with water production commencing on 28 December 2014. The Mahalo 7 surface to in-seam horizontal well was designed to maximise the use of current reservoir data and has been positioned inside the current pilot wells. The well contacted approximately 360 metres of coal in the horizontal hole section. The Mahalo 6 vertical production well was utilised to lift water from the Mahalo 7 horizontal well. Pump speed was initially kept low and constant such that a very gradual pressure drawdown was applied to the Mahalo 7 horizontal well section. After several months, three small pump speed increases were applied to the Mahalo 6 well with a significant increase in gas rate achieved. At the same time, the remaining vertical wells (Mahalo 3, 4 and 5) were shut in with downhole pressures monitored closely. Significant pressure responses were measured in all three wells as the pressure in the Mahalo 6 / 7 combination decreased, suggesting a well-connected network of fractures linking the horizontal well with the other Mahalo wells. In March 2016, the Mahalo 6/7 Vertical-Horizontal well combination reached a gas flow rate of 426,000 scf/d (standard cubic feet per day). The Company is very pleased with the rate achieved from Mahalo 7. This is a short horizontal proof of concept well and therefore is only contacting approximately 360 metres of coal. A development horizontal well in this area should be much longer and in contact with significantly more coal with proportionally higher gas rates. In addition to strong gas flow performance, relatively minor amounts of water are produced – around 20 bbl per day maximum, with the trend in water production reducing. This would indicate that water handling capital and operating cost expenditure in a development scenario may be very low, further strengthening the Company’s view on the value of the asset. Subsequent to the flow rate announced from Mahalo 7, the Mahalo 5 vertical well was brought on line at a slow pump speed, leading to a steady and increasing flow from this well. This was followed a month later with the opening up of Mahalo 4 in late April 2016 which exhibited immediate gas flow with little to no water. The total gas rate from the pilot scheme at Mahalo stabilised at about 460,000 scf/d. At the outset of the second quarter 2017, Comet Ridge announced that it had concluded an agency agreement with Santos QNT Pty Ltd (Santos), which saw Comet Ridge assume responsibility to manage the field subsurface work in respect of the Mahalo 2017 Joint Venture Exploration Work Program and Budget, in its capacity as agent for Santos the Exploration Operator for the permit area, until 31 December 2018. The Mira under-reaming work began in August 2017. This involved pulling out tubing and pumps from the wells, under-reaming the coals in Mira 3, 4 and 5 and then re-running tubing and pumps back into these so they can be put back onto production. The under-reaming was carried out safely and effectively over the first 2 weeks of August. Mira 2, the central well in the Mira pilot scheme was been set up as the intercept well for the Mira 6 horizontal. The configuration and concept is similar to the Mahalo 7 horizontal well which intercepted the Mahalo 6 vertical well. On completion of the under-reaming program, a larger rig was mobilised to the area to drill Humboldt South 1 corehole. Humboldt South 1 intersected 8.4m of net coal and good permeability was measured. Following the drilling of the Humboldt South 1 corehole, focus returned to the Mira Pilot area to drill the Mira 6 horizontal well. This well was designed to intersect the thickest of the 4 seams at Mira (Castor seam) and run for approximately 500m in seam prior to intersecting Mira 2 after which approx. 450m was drilled in the same seam. On completion of drilling, a pump and tubing was reinstalled in Mira 2. Mira 2 was utilized as the production well for Mira 6 horizontal, similar to the Mahalo 6/7 well combination at the Mahalo pilot 13km to the west. Mira 6/2 was brought online with pump speeds kept low initially and gradually increased over time. Initial production rates were encouraging and by March 2018 Mira 6/2 production had passed 1TJ/d, outperforming expectations of a short horizontal well. By June 2018 production had reached 1.4TJ/d. The Mira 6/2 combination has been highly successful and the outstanding results have come from continued work of the Joint Venture partners to reduce back pressure in the surface facilities. In February 2018, Comet Ridge announced it had executed a second agency agreement with Santos to operate and manage the Mahalo 2018 Joint Venture Exploration Work Program and Budget on behalf of Santos. Following the successful exploration and appraisal program in 2017, Comet Ridge announced a significant reserves upgrade for the Mahalo Gas Project. 2P reserves increased 473% to 172PJ and 3P reserves increased 71% to 374PJ in March 2018. Maiden 1P reserves of 18PJ (total) were certified over both Mahalo and Mira Pilots. The company is currently planning and preparing for a 5-well exploration and appraisal drilling program which is expected to begin in Q3 2018. As Mahalo has demonstrated its productive capacity, with low corresponding water rates, the Company believes that the asset will produce a significant volume of gas that can be operated at a very low cost of production which can be fed into either the LNG schemes or into substantial domestic demand. Given the shortage of gas in the East Coast market and the focus that all levels of government currently have on the issue, puts Mahalo in a very good position to help meet the demand requirements. On 25 October 2010, Comet Ridge announced a Contingent Resource Certification by NSAI for the Mahalo Project, the first certification for Comet Ridge in any of its Australian or New Zealand acreage. A considerable amount of appraisal work has occurred in the project area since the initial contingent resource booking in 2010. On 28 August 2014 Comet Ridge announced an initial independently certified Reserve Statement from the Mahalo JV Project Area and material upgrade to Contingent Resources. On 2 December 2015 Comet Ridge announced an increase in 2P and 3P Reserves in the Mahalo JV Project Area. Following the successful exploration and appraisal drilling program completed by Comet Ridge in 2017, a significant reserve increase was booked in April 2018. From the 2015 booking, 2P reserves increased by 473% to 172PJ. 3P reserves increased by 71% to 374PJ. The company was also pleased to announce a maiden 1P reserve booking of 18PJ due to the exceptional performance of the Mahalo and Mira pilot wells. 1) COI’s net Reserves have not bben adjusted for fuel or shrinkage (estimated at approximately 3%) and have been calculated at the wellhead (which is the reference point for the purposes of Listing Rule 5.26.5). 2) 1P Reserves have not been attributed to the Mahalo Block under SPE 2007 PRMS Guidlines as the field is not yet at develpment stage with an apporved development plan. 3) COI’s net Reserves have not been adjusted for fuel or shrinkage (estimated at approximately 3%) and have been calculated at the wellhead (which is the reference point for the purposes of Listing Rule 5.26.5). 4) 1P Reserves have been determined on the basis of the economic assumptions detailed in Annexure 1 see notes “LR 5.31.1 Material Economic Assumptions”. This upgrade in reserve certification demonstrates the commerciality of the Mahalo JV Project Area. The Project is located just 11 kilometres from an infrastructure connection to the Gladstone LNG market with significant gas supply requirements and rising prices. This is a significant milestone for Comet Ridge and is a very important step in the future development plan for the Mahalo JV Project. The company’s plan is to continue to build reserves and upgrade the category of these reserves as further production data from the Mahalo JV Project Area is collected and additional appraisal is undertaken. Uncommitted gas reserves in eastern Australia are becoming increasingly scarce so we are pleased to have a material volume of 3P reserves to work into the 2P category and a very large contingent resource base to work towards reserves.